The animated graphic below shows how gender differences in the US workplace have evolved over time, both in terms of employment and wages. 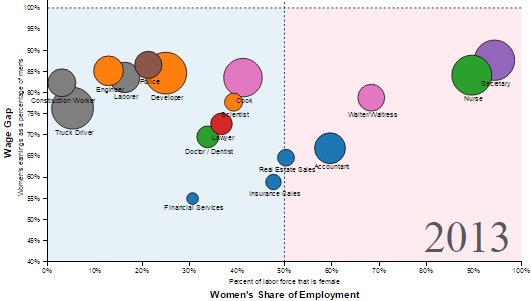 Each bubble in the chart represents a specific occupation. 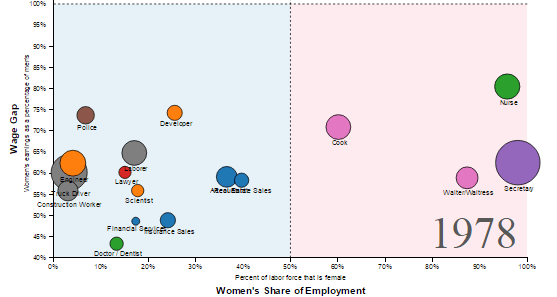 Based on its placement, you can see the percentage of the labour force that is female (horizontal axis) and the average wages earned by women as a percentage of those earned by men (vertical axis). 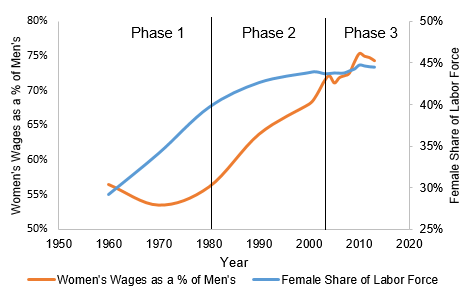 So as a bubble moves upwards, the gap between men's and women's wages is narrowing. As it moves to the middle, the proportion of men and women in this profession is becoming more equal. In 1960, the wages of female financial service workers and truck drivers were about 55% of men’s. Today, that number has increased to nearly 80% for truck drivers, but women in finance still earn the same: just 55% of men's wages. 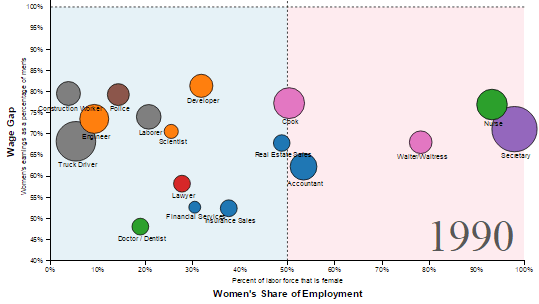 Some occupations even “switched genders.” In 1960, only 15% of accountants were women. 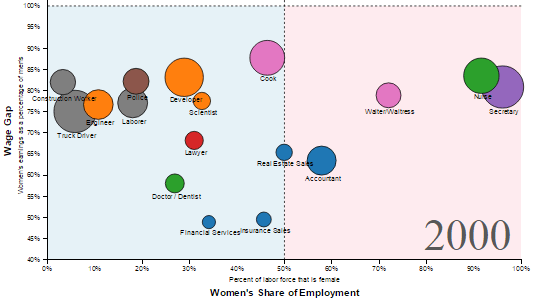 Today, there are more women accountants than men. 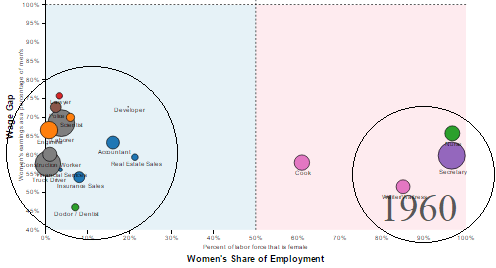 Likewise, "cook" went from being a mostly female job to one that is mostly done by men. Right from the start, I was struck by how polarized the occupations were in 1960, as if everything was either clearly a “man job” or a “woman job” with very little in between. And from there things seem to proceed in phases, the first phase being a movement toward the centre (meaning the occupations become less gender specific). Next, the trend takes a 90-degree turn. 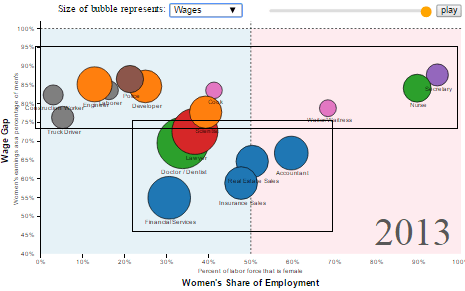 The labour force remains more or less the same, but the wage gap gets smaller as the bubbles move upward. First are the occupations where women still earn much less than men: doctors, lawyers, and several business-related professions. These occupations also happen to be the ones with the highest wages, and oddly they seem to have the most gender-balanced labour forces. For this debate, employment data alone does not make a conclusive argument because it only shows the outcomes, not the causes. So, I do agree that the 78% number that everyone quotes as the US wage gap is basically meaningless, since much of it can be explained by differences in occupation, education, etc. To pinpoint the causes, you really need a randomized experiment. Fortunately, there have been many of these, which show overwhelmingly that there is indeed gender bias in the workplace.